This is so clever. London based design and invention studio, Vitamins, works “in the spaces between science, technology, business and wonder.” They came up with this Out of the Box manual for Samsung after working with users of all ages across Europe and analyzing the difficulties that some people have in learning to use their new cell phone, especially older people. Instead of creating a special phone, they came up with a different approach: a user-friendly way to learn how to use the handset. 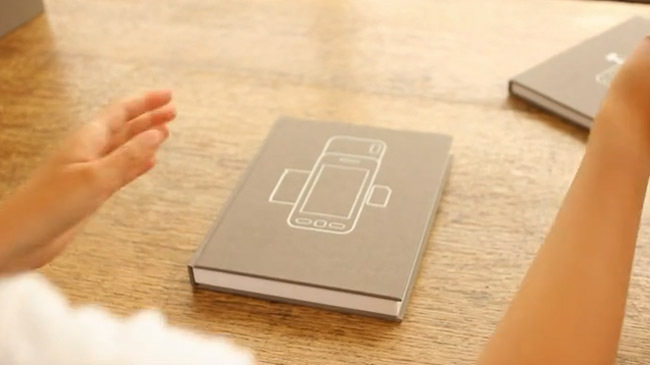 Instead of the usual complicated manuals they offer a set of books that can live on a bookshelf and actually contain the phone. Each page reveals the elements in their correct order, from sim card, to battery, to the case, and the second volume allows the phone to slide into a slot with arrows pointing to exact locations that the user should press. The video above demonstrates the Out of the Box experience which has won an Interaction Award 2012 for Best Concept and was exhibited in the MoMA’s Talk to Me exhibit last fall. Thanks to Daniela and Natan! This entry was posted in Graphic Design, Industrial Design, Interaction Design, Just Plain Cool, Stuff We Like. Bookmark the permalink. Very smart, the Samsung thing. For “older people”, indeed. But I REALLY love the Blah Blah rings! Very inspiring to know that kind of awareness is out there! Hope the other phone, camer and computer manufacturers adopt this approach!